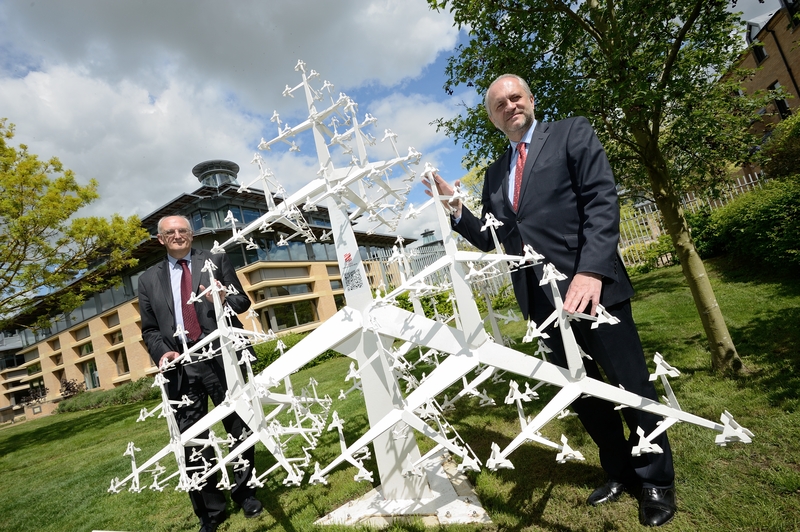 The close bonds between Poland and the University of Cambridge have been marked by the unveiling of a striking sculpture at the Centre for Mathematical Sciences on Wilberforce Road. It is a fitting symbol of the long history of mathematical excellence that is enjoyed by both Poland and Cambridge. The Sierpinski Tree is based on the geometric figure devised by Polish mathematician Waclaw Sierpinski who did pioneering work in the early 20th Century on the field of fractals. A fractal is a geometric figure in which each part possesses the same statistical properties as the whole. The Polish Ambassador, His Excellency Witold Sobkow, was welcomed to Cambridge by the Vice-Chancellor Professor Sir Leszek Borysiewicz, himself of Polish descent. 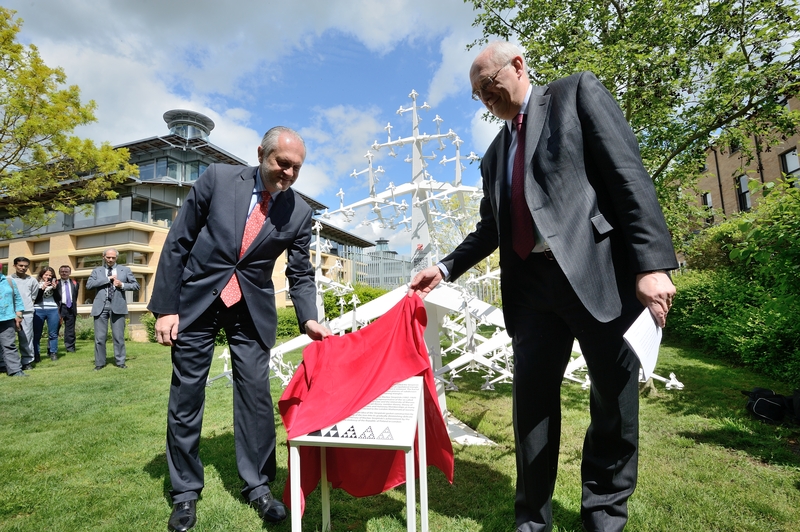 Unveiling the statue, the Ambassador said: "As ties between Poland and the University of Cambridge are stronger than ever before, there is no better place in Britain to celebrate the growing importance of Polish science. The Ministry of Foreign Affairs is proud of the establishment of the Polish Studies programme at the Department of Slavonic Studies, partly financed by the Foundation for Polish Science." 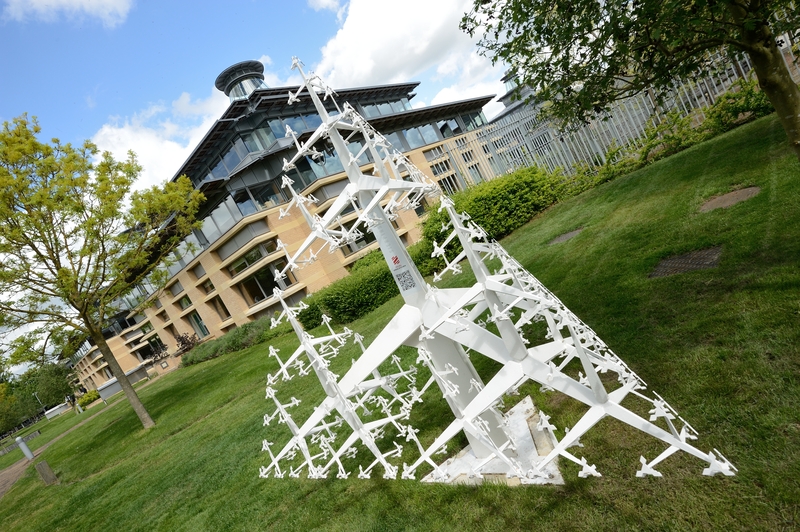 In response the Vice-Chancellor said: “I am delighted to see a new home for the Sierpinski Tree in the Centre for Mathematical Sciences. The tree has been installed by the University of Cambridge and the Embassy of the Republic of Poland in London to mark the centenary of Wacław Sierpiński’s achievement. It is a fitting symbol of the long history of mathematical excellence that is enjoyed by both Poland and Cambridge. “Our knowledge exchange with Poland extends to this day, with collaborations across a range of subjects. Last week we submitted a twinning bid to the EU Horizon 2020 programme, with the Wroclaw University of Technology, on Developing Scientific Excellence and Innovation Capacity in Data Science. The Sierpinski Tree, which was on display on London’s South Bank for the past year, celebrates Polish Science and is seen as a symbol of the modernity and dynamism of contemporary Poland. In response to growing interest in Poland, the University’s Department of Slavonic Studies launched a new initiative in Polish Studies in October 2014. This innovative pilot initiative – sponsored by the Foundation for Polish Science (FNP), the M. B. Grabowski Fund, Trinity College’s Zdanowich Fund, and the School of Arts and Humanities – combines undergraduate education in Polish literature and language with a rich cycle of special events, including guest speakers, public debates, film screenings, and academic conferences. The initiative aims to make Cambridge a key centre for the study of Poland in the UK and beyond. On 30 June-1 July 2015, Cambridge Polish Studies will be co-hosting an international conference on the future of Polish-Ukrainian relations at Sidney Sussex College.